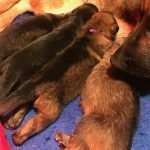 Litters & Puppies Available – German Shepherd Dog Club of SA Inc.
For further information on litters available or any other general inquiry, please contact our Puppy Listing Officer. What Price is a German Shepherd Pup? The average price today (2017/2018) is approximately $2,250 – $2,500. What Price are Pedigree Papers? Pedigree papers registered with the Australian National Kennel Council cost a breeder $37.00 per pup (2018). Are you listed with the German Shepherd Dog Club? Are the parents x-rayed for Hip Dysplasia and Elbow Dysplasia? What are their scores and could you view their documents? Are the parents Breed Surveyed? Can I view their Breed Survey? Australian National Kennel Council Main Register is a pedigree (Blue in Colour) for pedigree animals which can be exhibited in the conformation ring, trialling ring and bred with. Australian National Kennel Council Limited Register is a pedigree (Orange in Colour) for pedigree animals which can be exhibited in the Trial ring, they cannot be shown or bred with. They can be transferred to the Main Register with the Breeders authorisation. Contracts are an agreement between two (2) parties, the Breeder and the purchaser of the animal. Prior to signing any contract you should read it carefully and fully understand ALL of the conditions involved in the contract. If you are unsure of any condition in the contract ask for an explanation. What information and assistance will I receive with my pup? Is there information on training or suitable Club to receive training? Are there any guarantees with the pup?